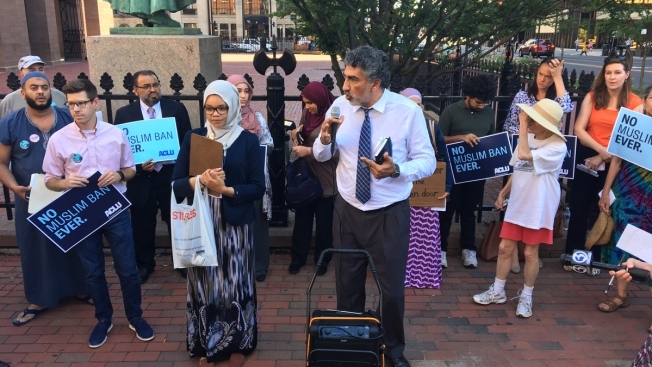 State House Square in Hartford saw about 50 protesters arguing for a reversal of the Supreme Court’s decision on President Donald Trump’s travel ban. The high court upheld the president’s executive action that barred visitors from several majority Muslim countries, in addition to North Korea and Venezuela. "We will not forget that unless he comes out and he apologizes and he reverses himself on this policy and so many other policies,” said Mongi Dhaouadi, who spoke during the protest on Friday. The high court ruled, on a 5-4 vote, that the travel ban was well within the president’s executive authority. The court also determined that the president, in his role as Commander in Chief, can make decisions when he deems it to be in the country’s national security best interest. David McGuire with the Connecticut ACLU, found that to be a flawed justification given President Trump’s track record. "The troubling thing about the ruling on Tuesday was that the court basically gave no considerations to statements that Donald Trump made as a candidate or tweeted out,” said McGuire. “It's very clear. He said he's going to stop Muslims from coming here, period. It was very concerning that the court just read the order on its face and really deferred completely to the president about security concerns." Muslims in Connecticut said Friday they feel the system designed to protect freedom of religion, let them down. "If you think of the Supreme Court, it's supposed to be the organization that is the checks and balances against a president out of control but we can see even the Supreme Court has abdicated its responsibility for being fair and for standing up to this nation and its values,” said Reza Monsour, president of the Islamic Center of Greater Hartford.